In a vast auditorium evocatively backlit in purple hues, a choir of young boys comprised of many different ethnicities prepare to sing the uplifting song, “From a Distance,” made famous by Bette Midler. The choir is Libera, a well-known English vocal ensemble comprised of boy sopranos ranging in age from seven to sixteen. The choir travels to perform at many famous venues, singing contemporary compositions or new arrangements of contemporary songs. In this video, they are performing in the Royal Albert Hall in London. 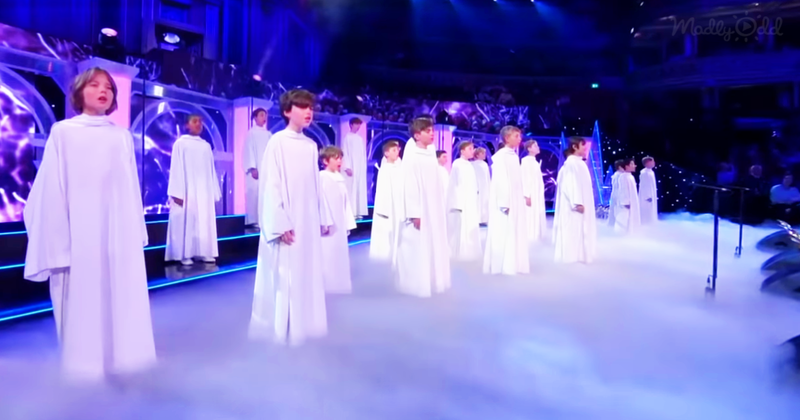 The boys are all dressed in white robes with mist obscuring their feet to evoke the typical renaissance interpretation of angels standing amongst the clouds in heaven. And they certainly do sound like angels, with the purity of their voices backed by a full orchestra they are simply a joy to hear. The Grammy award-winning song was one of the divine Miss Midler’s jewels in the crown. It was written by singer-songwriter Julie Gold in 1985. Midler made it a major hit in 1990 and won the Grammy for Song of The Year in 1991. She released it on her album “Some People’s Lives”. Her arrangement was different from the choir’s interpretation but no less magical. The message from the song is one of hope and peace. It tells of a future where men live in peace and hatred has no home. A very good message for these times, wouldn’t you say? If you were moved by the choir’s soul-stirring rendition of Midler’s song, please share their performance with your friends.